The Amputee Coalition included S. 1191/H.R. 2599 as one of its main legislative priorities for attendees to discuss during their Hill meetings. 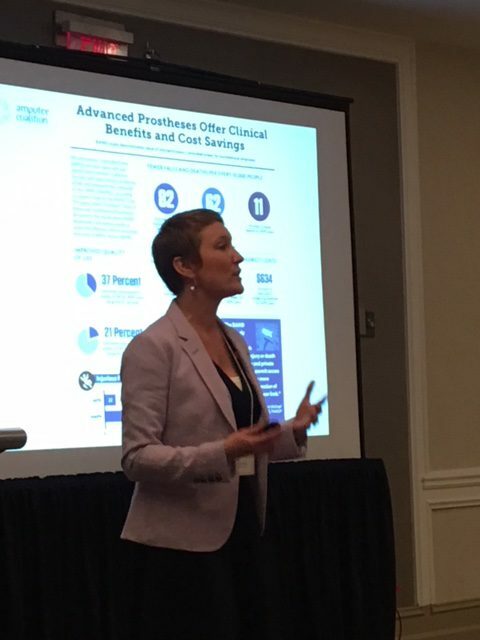 The Amputee Coalition emphasized that people with limb loss and limb difference deserve their prosthetic care to be provided by qualified clinicians. The Coalition supports adoption of a final regulation for BIPA 427 to ensure that only qualified providers are able to provide O&P Care, removing prosthetic and custom orthotic devices from the DME category to distinguish the unique rehabilitative nature of these devices in comparison to DME supplies, and enacting the remaining provisions of the Medicare O&P Improvement Act. As luck would have it, Tuesday was also scheduled the House Committee on Veterans Affairs Committee held a hearing on several bills, including the Injured and Amputee Veterans Bill of Rights (H.R. 2322), a Bill that has been championed by the National Association for the Advancement of Prosthetics and Orthotics (NAAOP). 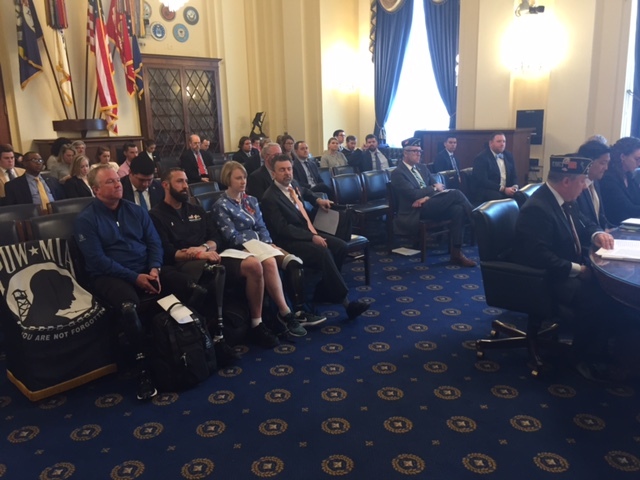 Several individuals with limb loss sat in the front row of the hearing as a sign of solidarity with Amputee veterans. AOPA included H.R. 2322 as one of its major policy initiatives during the 2018 Policy Forum in March, and was pleased to participate in the hearing on Tuesday. Nicole Ver Kuilen is no stranger to facing challenges and overcoming obstacles. 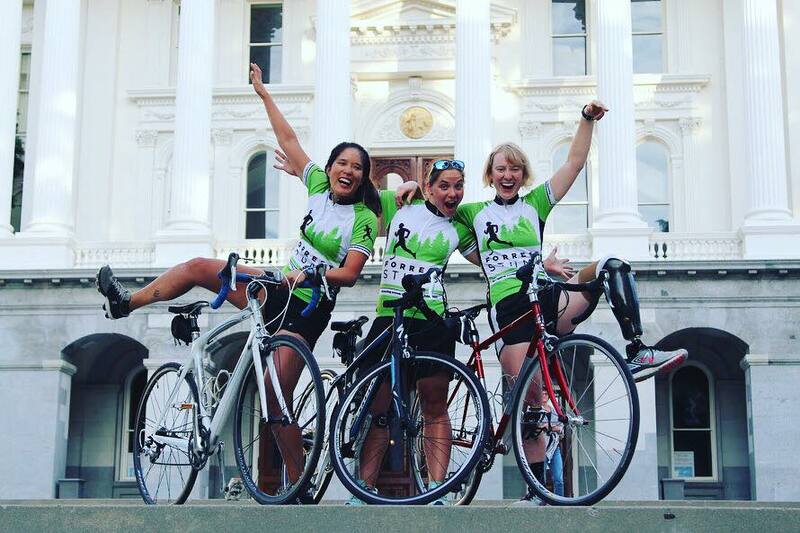 In fact, it is central to her existence, as an athlete, as an advocate, and as a person living with limb loss. 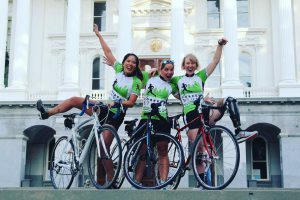 She has just completed a 1,500-mile triathlon down the West Coast. Along the way, she shared her own story, and advocated for legislative changes to improve healthcare coverage for prosthetic care. Nicole was diagnosed with bone cancer when she was 10 years old. A few months after her first chemo treatment, her medical team determined that her leg would need to be amputated to save her life. Learning to use a prosthesis is a challenge, but children are resilient, and Nicole was ready to get on with her new normal. That summer, Nicole was faced with a challenge that she didn’t know how to overcome. “All I really wanted to do that summer was go play in the water with my friends, but I learned that my leg wasn’t waterproof” said Nicole. Growing up near the Great Lakes in Michigan, Nicole was looking forward to the summer tradition, playing in the water with her friends and going to the water parks. Even showering became a limitation. Her family wrote their insurance provider to request approval for Nicole to receive a waterproof prosthesis, so that she would not have to face these types of limitations for the rest of her life. Insurance denied the request. “They wrote back and said this is a convenience item, it’s not medically necessary; so, we didn’t really push it because we thought no meant no,” said Nicole. This was her first experience with being denied access to the prosthetic care she wanted and felt she needed. 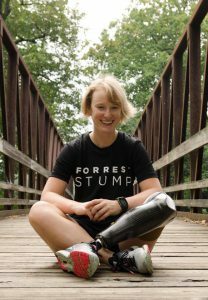 When she was 16, her high activity level was causing a lot of breakdown to her prosthesis, but Nicole was denied by her insurance company for a running prosthesis, despite her need for better technology to stay active. “It wasn’t really until this past year that I really just got fed up with the system and the fact that I had been dealing with the same barriers over and over again for 16 years, said Nicole.” She was in the process of having a new prosthesis built and trying to find something that insurance would cover that would allow her to continue running half marathons and competing in bike races. “After jumping through all the hoops, 26 appointment and a year later, I basically had to settle for the same technology that I’d had for the past five years,” said Nicole. 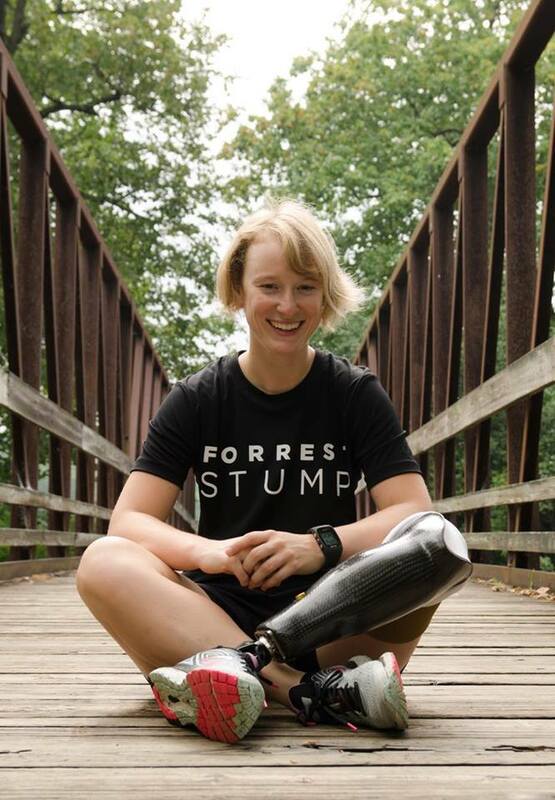 Motivated by her own challenges with access to appropriate prosthetic technology and care combined with her growing awareness that so many others are unable to access the prosthetic care they need, Nicole launched ForrestStump.org and began planning the 1,500-mile journey, running, biking and swimming down the West Coast. Natalie is new to the O&P profession, but wants to see more people living with limb loss get access to the appropriate technology for their prosthetic needs. “We’re not advocating for every amputee to get a running blade, because that is not appropriate for every amputee; we’re only asking that the technology that is available be accessible, when appropriate, to all amputees,” said Natalie. Nicole and Natalie joined Dr. David Boone and University of Washington O&P student Justin Rheault for Hill visits during the 2018 AOPA Policy Forum. Watch the videos below or listen to the Podcast to find out more about Forrest Stump and Nicole’s experience on Capitol Hill. Huge Win: Orthotist/prosthetist notes will be considered part of the patient’s medical record by CMS! SEC. 50402. ORTHOTIST’S AND PROSTHETIST’S CLINICAL NOTES AS PART OF THE PATIENT’S MEDICAL RECORD. ”(5) DOCUMENTATION CREATED BY ORTHOTISTS AND PROSTHETISTS. – For purposes of determining the reasonableness and medical necessity of orthotics and prosthetics, documentation created by an orthotist or prosthetist shall be considered part of the individual’s medical record to support documentation created by eligible professionals described in section 1848(k)(3)(B).”. Even with this one sentence, straightforward provision, there may be questions of timing applicability and such to be resolved – but the win is complete. The Orthotist and Prosthetist Notes are now officially part of the medical record for purposes of Medicare medical necessity and claims audits! AOPA hosted a press event at the National Press Club in Washington DC, to share the important research from the RAND Corporation on the economic value of advanced prosthetics. Dr. Soren Mattke, M.D. from RAND Corporation presented the findings of this just published research that concluded that microprocessor knees are associated with improvements in physical function and reductions in falls and osteoarthritis, and that the economic benefits are in line with commonly accepted criteria for good value for money by U.S. payers. Dr. Ken Kaufman, PhD of the Mayo Clinic, shared his research on health outcomes for those living with limb loss, including the cost of care broken down by K-level, and the costs of falls. He also shared his research that shows that many patients receiving an amputation are never given a prescription for a prosthetic device. Prosthetic users Christopher Allen and Peggy Chenoweth shared their compelling stories of how they have benefited from advanced technology in their everyday lives. The full RAND report can be accessed here. See a video of the fashion show, provided by the White House, as well as a recording of the closing remarks by Alison Cernich, Director of NICHD National Center for Medical Rehabilitation Research, below. 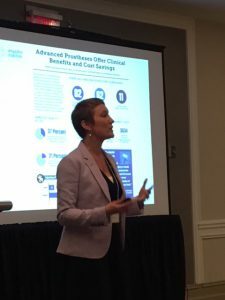 Alison Cernich discussed an ambitious research plan mapped by 17 institutes and centers at the National Institutes of Health during her closing statement at the White House Design for All Showcase. See the full Design for All Fashion Show below. We are the American Orthotic & Prosthetic Association (AOPA). We are committed to providing outreach, services, and products to the public and O&P professionals. Visit our website. 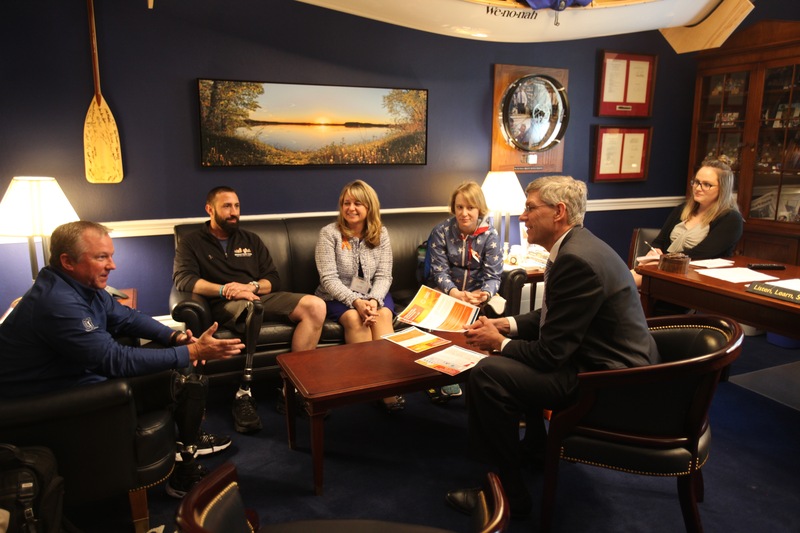 We have partnered with the Amputee Coalition, the nation’s leading organization on limb loss, dedicated to enhancing the quality of life for amputees and their families, improving patient care and preventing limb loss. Visit the Amputee Coalition website. © American Orthotic & Prosthetic Association. All rights reserved. Mobility Saves, both the logo and the words are proprietary, having been developed and owned by the American Orthotic & Prosthetic Association.